Mystery Photo was of an RAN helicopter partially hidden behind a fence. The photo is attributed to Jim Lucey. We asked our readers if they could tell us the type of helicopter, where it was taken and when, and what it was doing there at the time. The photo is one of those amazing snapshots in time which capture not only an event, but the mood of the people in it. 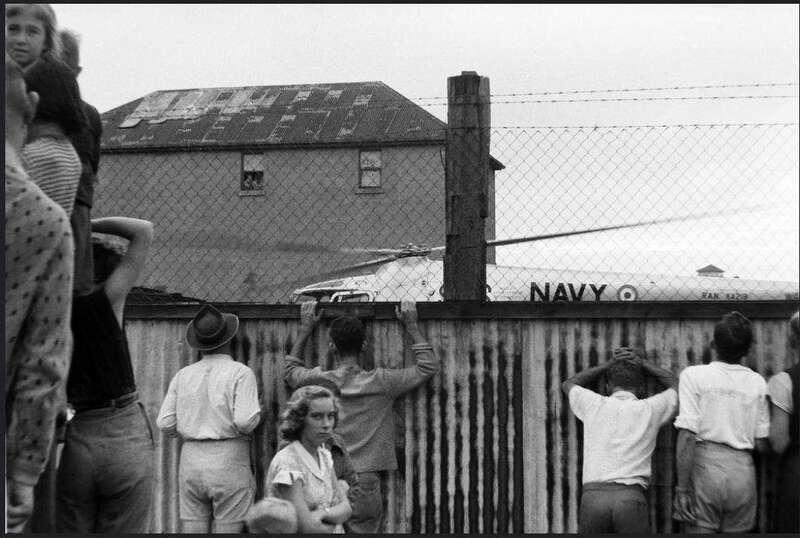 they are peeping through a corrugated iron fence at a Navy Sycamore helicopter, which was probably a rare thing to see in those days. It is at Maitland, in NSW, and would have been taken early in 1955 when the area was stricken by floods. The RAN sent three Sycamores to help the relief effort. The first Sycamore, flown by Gordon McPhee, was airborne within half an hour of receiving the call for assistance. 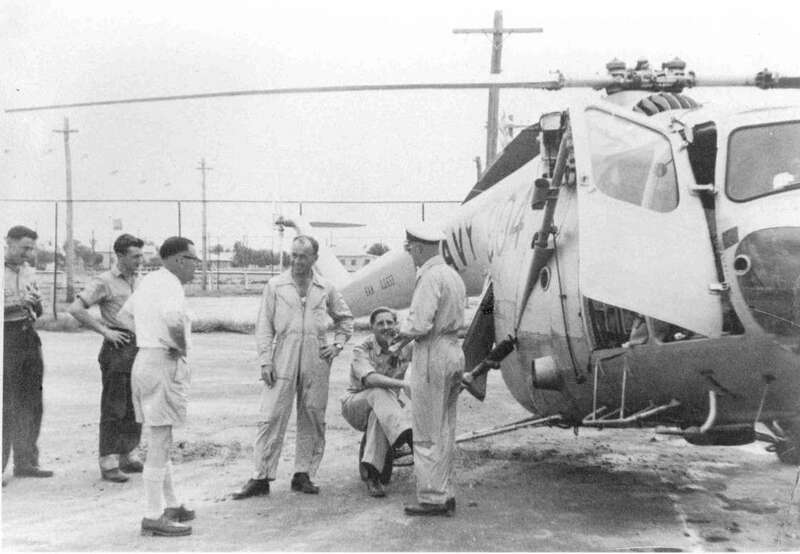 Over the next few days he and fellow aircrew conducted rescues, medical evacuations and dropped essential supplies to the beleaguered people of the district. One medivac was of an mentally ill patient who didn’t want to get into the aircraft! It too three men together with handcuffs and shackles to persuade him. Another unusual job was to sling load a kerosine fridge from the local Pub to a hospital across the Namoi River, to allow the hospital to keep essential drugs cool. The three Sycamores covered quite a bit of the countryside, rescuing some 100 people (there was also a tragic crash – see image below) and they reached as far afield as Dubbo, Narrabri and Wee Waa as you will see from the photo (left) taken at Narrabri with the GG Sir William Slim and the NSW Police Commissioner, which includes the same helicopter. The fellow wearing the Mae West looks like the one sitting the helicopter wheel in the photograph above. 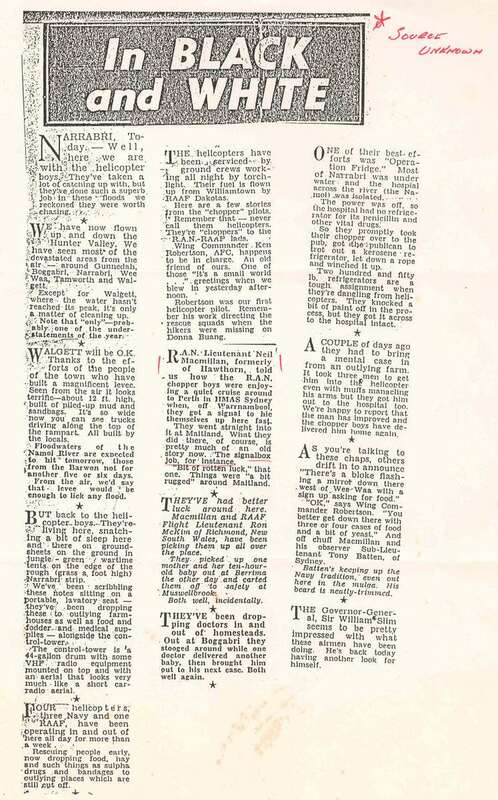 John Ahern also provided the following information, which is a compendium of number of news clippings regarding the Narrabri floods. Source unknown but we think it was printed in the Sydney Morning Herald. Below. 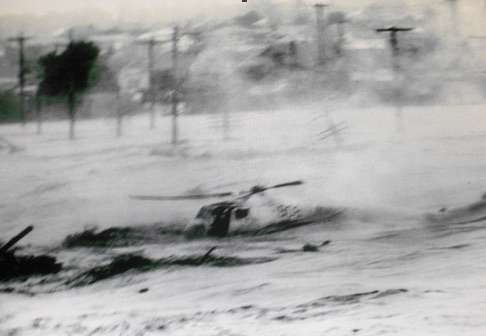 A dramatic image of Sycamore XA221 ditching during the Maitland Flood rescue. The aircraft reportedly struck power cables whilst attempting to pluck two people from the water. The crew were rescued unhurt five miles downstream by an Army Duck. The two men on the winch were drowned. Below. Maintenance had to be done in the field, using whatever means were possible including borrowed kero drums and crates. 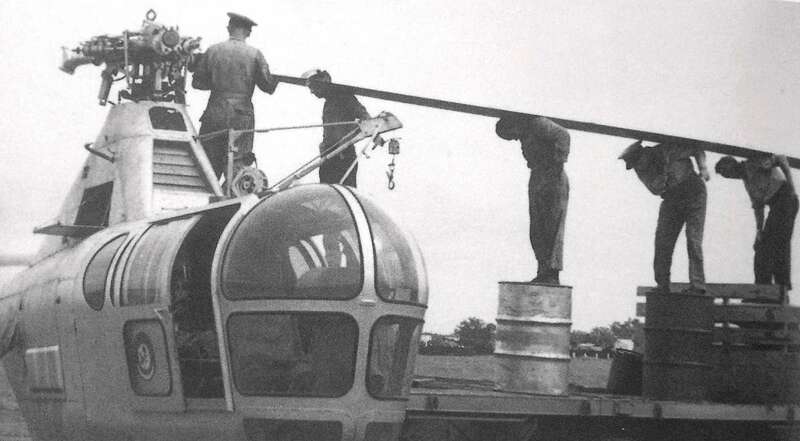 Here a crew change a blade on one of the aircraft, using a bit of ingenuity and muscle. If any readers can provide further details they would be most welcome. Simply use the ‘Contact Us’ form at the foot of this page. To return to Home Page, click on the Wings logo at the top of this page.